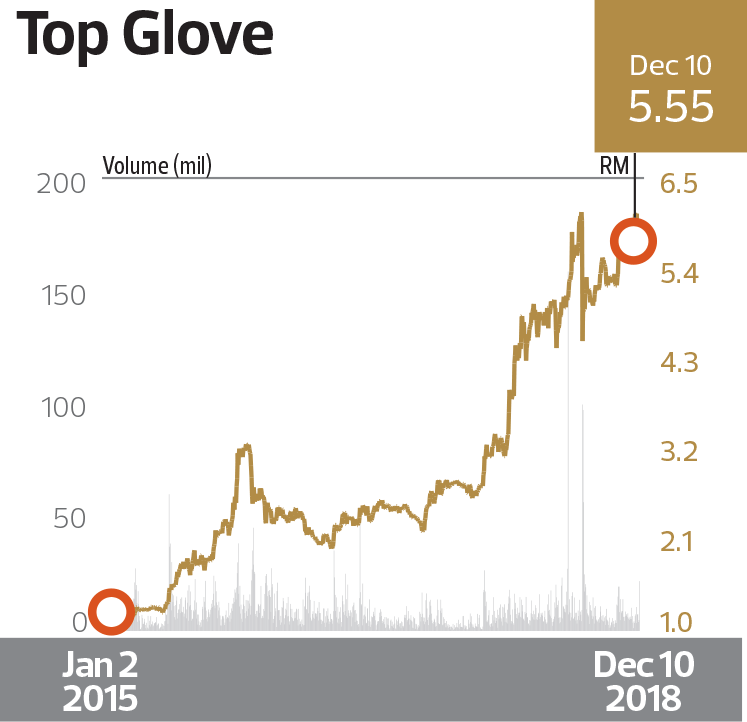 "HIGHEST RETURN ON EQUITY OVER THREE YEARS (JOINT WINNER) / HIGHEST RETURNS TO SHAREHOLDERS OVER THREE YEARS / HIGHEST GROWTH IN PROFIT AFTER TAX OVER THREE YEARS: HEALTHCARE: Top Glove Corp Bhd - Mark Of A Market Leader | The Edge Billion Ringgit Club 2018"
The strong US dollar has been a boon for export-oriented glove makers, including Top Glove Bhd, which is the world’s largest in terms of capacity. However, that was but one factor. Top Glove achieved its double-digit earnings growth as it never rested on its laurel, despite its leading position in the rubber glove industry. Executive chairman Tan Sri Lim Wee Chai has said that the group wants both organic and inorganic growth. The group has continuously expanded production capacity as well as acquired other players for inorganic growth. Armed with a strong balance sheet, Top Glove could afford to be on an opportunistic mergers and acquisitions trail. While, gloves remain its core product, its M&A targets could be “vertical acquisitions” — namely players in the upstream or downstream segments. For instance, Top Glove bought into rubber plantations to secure a supply of latex. It also acquired a print and packaging material manufacturer and it has ventured into condom manufacturing. In short, Top Glove has always been on its toes. This explains why growth remains strong even after 27 years. In FY2017, the group achieved record-high sales revenue of RM3.41 billion following its double-digit growth in sales volume despite a rather challenging operating environment. In FY2014, revenue was RM2.28 billion. Top Glove’s net profit grew to RM328.6 million in FY2017 from RM180.5 million in FY2014 — a solid three-year compound annual growth rate (CAGR) of 22.1%. This was far above its peers’. This year, Top Glove undertook a one-for-one bonus issue of 1.28 billion new shares to reward shareholders. Given its solid earnings track record, it is not surprising that Top Glove’s share price has skyrocketed. It quadrupled over the course of three years from RM1.56 on June 30, 2015, to RM6.04 on June 29, 2018, reflecting a more than 57% CAGR over three years. Consequently, its market capitalisation has ballooned to RM7.04 billion in FY2017 compared with RM2.97 billion in FY2014. This put Top Glove on the list of 30 component stocks of the FBM KLCI effective Dec 24. At the time of writing, Bloomberg shows there were 18 research houses covering the stock, with seven calling a “buy”; eight, a “hold”; and three, a “sell”. Target prices ranged from RM4.45 to RM6.52. With a commitment to reward shareholders 50% of its profit after tax and minority interest (Patami), Top Glove paid total dividends per share of 7.25 sen for FY2017, which represents 55% of the group’s Patami. RM2 billion. Based on the awards criteria, its three-year adjusted and weighted ROE was 18.6%, making it a joint winner in this category. Going forward, Top Glove’s target is to gain a foothold in Vietnam. The group has allocated an additional RM100 million to set up a new plant in Vietnam to make vinyl gloves, raising its capital expenditure to RM213.3 million for FY2019. Lim said the factory, which will be completed in one to two years, will complement its operations in China as the cost of production has been rising there. The Vietnam factory sits on 20 acres and will have 10 production lines producing at least 1.5 billion pieces of vinyl gloves annually. Meanwhile, Top Glove completed its acquisition of Aspion Sdn Bhd this year, which will strengthen its position in surgical glove production. Aspion is expected to meet its net profit projection of RM80 million within the next four to seven years despite the legal proceedings between the group and a former stakeholder of Aspion.